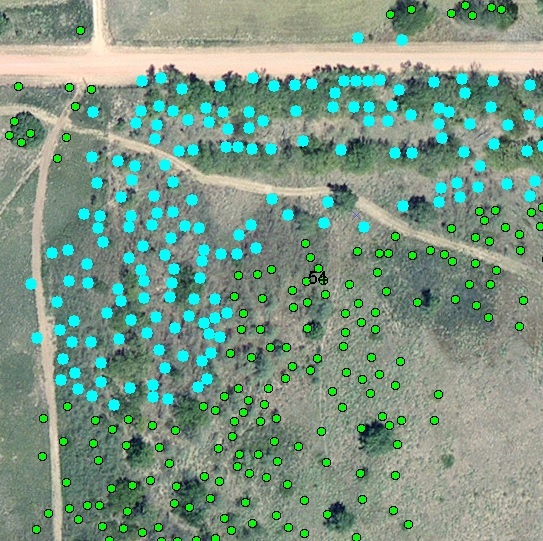 What methods are available in ArcGIS 10.2 to randomly subset a selection of points. For example, in the attached screenshot I am interested in keeping 20% of the selected points and deleting the rest. 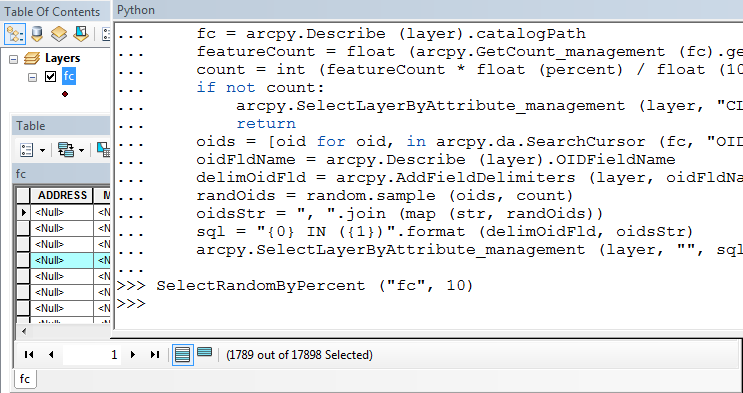 print "percent is greater than 100"
print "percent is less than zero"
Copy/paste this into the python shell in ArcMap. Then in the shell type SelectRandomByPercent ("layer", num), where layer is the name of your layer, and num is a whole number of your percent. print "input count is greater than layer count"
Generally, I also recommend using the spatial ecology tools as discussed by blah238. This will create random values between 0 and 1. Then, if you want to select 20% of the features, you could select features where the Random value is less than 0.2. Of course, this will work better with many features. I created a feature class with only 7 features as a test and there were no values less than 0.2. However, it looks like you have plenty of features, so that shouldn't matter. 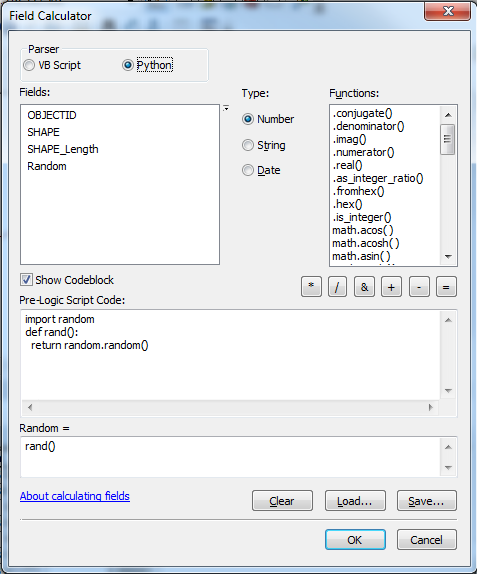 There is also an earlier Select features at random script from @StephenLead available for ArcGIS Desktop. Although written, I think, for ArcGIS 9.x, and last modified in 2008, I used it in about 2010 at 10.0, and it still worked well. Note that the existing selection is not honored so you would have to make a feature layer from the existing selection first. 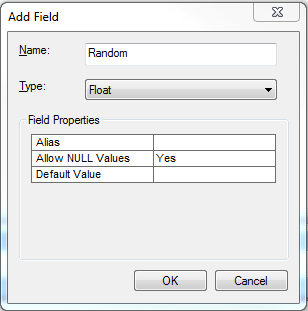 Here's another random selection add-in for ArcGIS 10, the Sampling Design Tool. It will let you select 20% of the features in your dataset. However, this doesn't use a selected set to make a random selection, similar to the restrictions of the Hawth's Tools mentioned by blah238. Divides the original dataset into two parts: one part to be used to model the spatial structure and produce a surface, the other to be used to compare and validate the output surface. One disadvantage is that you need the Geostatistical Analyst extension. Not the answer you're looking for? Browse other questions tagged arcpy arcgis-10.2 editing select random or ask your own question. Randomly selecting points within polygons in ArcGIS Desktop? Random selection of polygons in ArcMap? Differences between Python window and IDLE for Scripting with ArcGIS Desktop? Random Selection using Select By Attributes tool in ArcMap? Getting working Python script to run from toolbox? Selecting points using random field values in ArcGIS Desktop? Unselecting Individual Selected Features using ArcObjects? Selecting first 5 rows of selection after reverse sorting using attribute field in ArcPy? Is the QGIS “Random selection within subset” selecting spatially random or randomly from the attribute table? Merging selected features in one DBF table (polygons) using ArcPy?